Hindu Marriages in India are a grand affair, involving a lot of customs and rituals and where the whole community of family, friends, relatives and social circle come together to celebrate the occasion with great style and pomp. Hindu Marriages in India are usually considered an once-in-a-lifetime, auspicious affair. Depending upon the region to which the couple belongs, there is a host of customs and rituals involved. In many Indian communities, Hindu Marriages are a lengthy, drawn out affair with many lasting up to a week or so. The tradition and customs differ from one state to another. Many communities are very strict about these rituals while others are not. With time many old rituals and customs have been discarded, but Indian marriages are still considered as a spiritual affair. Sagai, Mehendi, Haldi and Tilak are some of the important pre-wedding customs followed across northern states. Sagai refers to the engagement ceremony, which happens prior to the wedding. It is a comparatively sober affair compared to the main wedding but still celebrated with great style. The Mehendi ceremony is also a pre-wedding celebration, where the bride and other women in the family get their hands decorated with heena. There is a lot of dancing and singing throughout the ceremony. A Haldi ceremony on the other hand is an affair in which both the groom and the bride participate. Haldi is applied on them generously by all family members, relatives and friends. In a Tilak ceremony, the groom is welcomed at the bride's home by applying a Tilak on his forehead and he is presented with shagun (auspicious offering). These are some of the commonly followed pre-wedding customs in an Indian Hindu Marriage. Then the most important day, i.e. is the marriage day itself, is celebrated with great fanfare and enthusiasm. On this day, there is the Phera ceremony, which is considered very auspicious and holy and an Indian Hindu marriage is incomplete without this ritual. This ceremony involves circling around the sacred fire seven times to seal the marriage vows. An emotional ceremony before the Phera, is the Kanyadaan where the bride's father gives away his daughter. An equally emotional and sensitive affair involves the bride's finally leaving for her husband's home which is called Bidai. 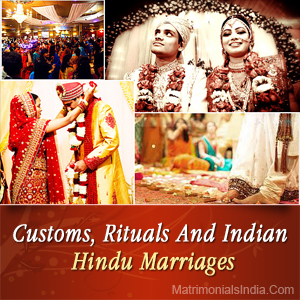 These are just some of the main ceremonies followed; Hindu marriages involve a wide array of many other customs and rituals.